We want to help you kick off your own Durham staycation with a giveaway from Unscripted Hotel. They’re hooking up one lucky winner with a one night stay in a City View King, breakfast for two and a couple of Shop Durham cards to help you experience more of Durham. Head to our Instagram to enter! It’s funny to think about being a tourist in your own city. You live here, you get set in your everyday ways and commutes, but when you step out and do something a little differently, you feel brand-new and see things in a whole new way. A staycation in Durham is the perfect opportunity to splurge on all of your favorites that you don’t normally get to do or new some new experiences! Our number one pick for where to stay on your staycation in Downtown Durham. Unscripted Hotel is located in City Center and is central to so many great restaurants and shops, making it walkable to pretty much anything you want to experience Downtown. The rooms are gorgeous, spacious, and clean. There’s a rooftop pool making it the perfect spot to sip cocktails in the warmer months. Even when the weather is cooler, the rooftop is a great spot to catch the sunset. Head downstairs for breakfast in the morning for a full espresso bar and some light eats then there’s food available all day serving up sandwiches, soups, salads, and desserts. It even turns into a cocktail bar at night so you can grab a nightcap after you’ve explored all Durham has to offer. They also have a local’s only staycation special that includes Parking and a 2pm late check-out. Downtown is a mecca of art and culture. Start with the many art galleries like 21c Museum, where you’ll find rotating visual and contemporary art exhibitions. Admission is free and it’s open 24/7. Pleiades Arts showcases some of the Bull City’s best and brightest local artists. Then head to the Durham Arts Council, which is loaded with paintings, ceramics, fiber arts, glass art, jewelry, digital photography, and other mixed media from Durham and the Triangle’s most talented artists. Stop by Discover Durham to pick up a guide to the city’s many murals and try to spot them all. Get out and explore it all. DPAC presents hit Broadway-quality performances like Hamilton, The Book of Mormon, and Wicked. Since 1926, the Carolina Theatre has put on performances of award-winning comedies, treasured classics, and musical acts. For live music check out Pinhook. It’s a DURM staple with great live performances and inexpensive drinks. (Tip: Head upstairs for delicious Pie Pushers pizza!) And for national and local acts alike, head to Motorco Music Hall. 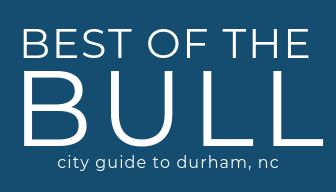 Starting in the Spring, Bull City Laughs will guide you on a tour of Durham filled with history and lots of laughs. The tour departs from 9th Street, BYOB and settle in for a 90-minute tour of spots like Duke University, NCCU, Duke Gardens, and more. You’ll learn something new — maybe even about your own street. If your staycation is planned for a Friday night, head down to the Farmer’s Market on Saturday morning. It’s just a few blocks from Unscripted Hotel. Grab donuts from Rise or one of the many food trucks and do some shopping at the Arts & Craft Market. The Liberty Arts Foundry also does tours on Saturday mornings. Durham Distillery is home to award winning Conniption gins, cold distilled cucumber vodka, and decadent Damn Fine liqueurs. They were even named the No. 1 Craft Gin Distillery in the US! Their tours are perfect for date nights or just a fun evening with friends! Bonus: You can get 50% off distillery tours with your Shop Durham card! There’s so many great yoga studios in Durham like Community Power Yoga, Global Breath, Yoga off East, or warm up with some hot yoga at Arrichion. A great option within walking distance of Unscripted is yoga with LaVita Yoga on the rooftop of the Durham Hotel on Saturday Mornings ($10/each) or at Bull City Ciderworks ($12/ea includes a pint of cider, cidermosa, or kombucha after class). With a space spanning over 10,000 square feet, Boxcar Bar + Arcade features a full bar (including 24 American craft drafts), 70+ arcade games, and wood fired pizza kitchen. Head over to Urban Axes to test your ax throwing skills, and Quarter Horse Arcade to play even more retro arcade games. If you want to shop in Durham, downtown is one of the best spots to do it in. Most obviously, you’ll want to hit Main Street, where you’ll find a seemingly endless line of unique local shops, including Dolly’s, Bungalow, Letter’s Bookshop, Exotique, and Vert & Vogue. Just one street over, you’ll find the always fabulous Chet Miller, Everyday Magic, and the Artisan Market. For the aesthetics and great shopping, peruse Brightleaf Square, a historic district featuring the must-visit Morgan Imports, Parker and Otis, Song of Sixpence, and Indio. Want to learn more about Durham? Preservation Durham offers free walking and bike tours that introduce downtown Durham’s history and architecture! Tours are Saturdays, April through November at 10am. Third Fridays are one of our favorite date nights because you get to explore so many different art galleries, shops, and restaurants in one outing. There’s free admission at art galleries like Golden Belt Campus, Pliedes Arts, and Durham Arts Council plus live music on street corners downtown. Also be sure to check out our event calendar to help plan your staycation! It should come as no surprise that Downtown is packed with eateries, and fantastic ones at that. Start with some of the city’s best brunches at Beyu Caffe, or sweetly satisfying treats at Ninth Street Bakery or Loaf. We’re big fans of Bagel Bar’s sandwiches and Rise’s biscuits. No one pulls out all the stops like Geer Street Garden does at its Sunday brunch buffet. For lunch, try traditional Cuban dishes at Copa, or mediterranean cuisine at Neomonde. Head to Goorsha for traditional Ethiopian cooking like sambusa, kekel & spicy vegan stews. Check out the classic King’s Sandwich Shop for the best affordable eats you can find or Lucky’s for a New York Style Jewish Deli. And for dinner, make reservations at Mother and Sons for some of the best Italian food you’ll ever have or Gonza Tacos in West Village. Little Dipper Fondue and Clouds Brewing are more great options.. If you’re still hungry for late night eats, Hutchins Garage offers late night pizza Wednesday-Saturday. Jack Tar Dinner serves up breakfast all day long and an exceptional fried chicken dinner on Sunday evenings. On Geer Street, Cocoa Cinnamon (that brews their own beans) is so cozy, try their hot chocolate in the winter and hang on their patio in the warmer months. Expand your coffee horizons at Counter Culture and check out their free tastings on Friday Mornings at 10am. At the hip Durham Hotel, it’s all about the mid-century vibes and coffee sodas. And at Kaffeinate, you have to try their specialty lattes. The bakery and dessert offerings are just as sweet. The Parlour will change the way you think about ice cream, with unexpected flavors like Sweet Potato Pecan, Apple Pie, and vegan varieties in addition to the classics. Ninth Street Bakery also offers irresistible baked goods alongside a cafe menu. At Loaf, enjoy some of the best cookies in Durham; at Rose’s, their ice cream sandwiches are pretty much a necessity. And the sweetness continues at Pine Cone Ice Cream, which rocks local ice cream, coffee, and baked goods. Be sure to stop by Durham Hotel and watch the sunset, it’s one of the hottest patio destinations in the city. Head back to Unscripted Hotel to dip your toes in the rooftop pool and overlook downtown. At Alley Twenty Six, you’ll find unique hand-crafted cocktails and the prettiest alleyway you’ve ever seen. Check out European-inspired wine bar Bar Brunello and Bar Vigile boasts one of the largest Spirits selections in the Triangle. Head to Honeygirl Meadery for something a little different. LouElla, is a bottle shop and bar located next to Hutchins Garage is expected to open up in February. There’s Durty Bull Brewing Company, Ponysaraus, or Fullsteam for beer lovers alike, and Bull City Ciderworks is the standout spot for cider. Head to Fullsteam on the 1st Saturday of the month for the Patchwork Market that showcases local markers. Shop Durham local business within half a mile of Unscripted. Click here to see more than 195 participating businesses. Bull City Dental	Free t-shirt with your visit!